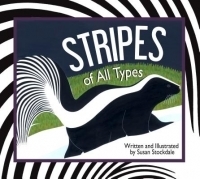 In Stripes of All Types, author and illustrator Susan Stockdale brings to life a patterned parade of animals, showing young readers some of the many reasons stripes are found so often in nature. Bouncy, alliterative rhyme and simple phrases keep readers entertained, while a glossary at the back provides more in-depth information on each featured animal. An afterword provides more information on each featured animal and where it lives, and explains the role its stripes play. Readers can test their knowledge of animal stripes with a fun matching game at the end! This is a fun, informative book that will grab early readers' attention even while it teaches them lessons about animals all across the globe. Each page is devoted to one striped animal. Big, bold, colorful illustrations depict the animal in its natural habitat. The rhyming prose is concise and easy for young readers to follow along. I especially enjoyed the pages in the back of the book that gave specific facts about each featured animal (Such as how ring-tail lemurs communicate with their striped tails, and how the stripes on the wings of the zebra swallowtail butterfly help confuse predators. ), and the page that included a "name that animal" game. This book is a lovely, thorough teaching tool that readers will enjoy. I highly recommend it.